"ପୋଲିଓ" redirects here. ଭୁତାଣୁ ନିମନ୍ତେ, ଦେଖନ୍ତୁ ପୋଲିଓ ଭୁତାଣୁ. ପୋଲିଓସିସ, କେଶ ଧଳା ବା ଧୂଷର ହୋଇ ଯାଉଥିବା ରୋଗର ନାମ ସହିତ ଭ୍ରମିତ ହେବେନି ! Disability-adjusted life year for poliomyelitis per 100,000 inhabitants in 2004. ↑ ୨.୦ ୨.୧ ୨.୨ ୨.୩ ୨.୪ ୨.୫ ୨.୬ "Poliomyelitis Fact sheet N°114". who.int. October 2014. Retrieved 3 November 2014. ↑ "Guidance to US Clinicians Regarding New WHO Polio Vaccination Requirements for Travel by Residents of and Long-term Visitors to Countries with Active Polio Transmission". CDC. June 2, 2014. Retrieved 4 June 2014. ↑ Aylward R (2006). "Eradicating polio: today's challenges and tomorrow's legacy". Ann Trop Med Parasitol. 100 (5–6): 401–13. doi:10.1179/136485906X97354. PMID 16899145. ↑ "Global leaders support new six-year plan to deliver a polio-free world by 2018". who.int. 25 April 2013. Retrieved 4 November 2014. ↑ "Polio in the Syrian Arab Republic - update". who.int. 26 November 2013. Retrieved 4 November 2014. ↑ "WHO statement on the meeting of the International Health Regulations Emergency Committee concerning the international spread of wild poliovirus". who.int. 5 May 2014. Retrieved 4 November 2014. ↑ Falconer M, Bollenbach E (2000). "Late functional loss in nonparalytic polio". American journal of physical medicine & rehabilitation / Association of Academic Physiatrists. 79 (1): 19–23. doi:10.1097/00002060-200001000-00006. PMID 10678598. ↑ Leboeuf C (1992). The late effects of Polio: Information For Health Care Providers (PDF). Commonwealth Department of Community Services and Health. ISBN 1-875412-05-0. Archived from the original (PDF) on June 25, 2008. Retrieved 2008-08-23. ↑ Todar K (2006). "Polio". Ken Todar's Microbial World. University of Wisconsin - Madison. Retrieved 2007-04-23. ↑ Sabin A (1956). "Pathogenesis of poliomyelitis; reappraisal in the light of new data". Science. 123 (3209): 1151–7. doi:10.1126/science.123.3209.1151. PMID 13337331. ↑ Gawne AC, Halstead LS (1995). "Post-polio syndrome: pathophysiology and clinical management". Critical Review in Physical Medicine and Rehabilitation. 7: 147–88. Reproduced online with permission by Lincolnshire Post-Polio Library; retrieved on 2007-11-10. ↑ Young GR (1989). "Occupational therapy and the postpolio syndrome". The American Journal of Occupational Therapy. 43 (2): 97–103. 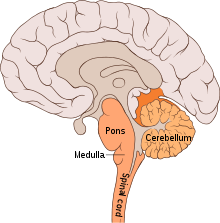 PMID 2522741. ↑ Nathanson N, Martin J (1979). "The epidemiology of poliomyelitis: enigmas surrounding its appearance, epidemicity, and disappearance". Am J Epidemiol. 110 (6): 672–92. PMID 400274. ↑ Frauenthal HWA, Manning JVV (1914). Manual of infantile paralysis, with modern methods of treatment. Philadelphia Davis. pp. 79–101. OCLC 2078290. ↑ Cono J, Alexander LN (2002). "Chapter 10, Poliomyelitis.". Vaccine Preventable Disease Surveillance Manual (PDF) (3rd ed.). Centers for Disease Control and Prevention. pp. 10–1. Archived from the original (PDF) on 2008-10-10. ↑ Professional Guide to Diseases (Professional Guide Series). Hagerstown, MD: Lippincott Williams & Wilkins. 2005. pp. 243–5. ISBN 1-58255-370-X. ↑ "Case definitions for infectious conditions under public health surveillance. Centers for Disease Control and Prevention" (PDF). Morbidity and mortality weekly report. 46 (RR–10): 26–7. 1997. PMID 9148133. ↑ Gawande A (2004-01-12). "The mop-up: eradicating polio from the planet, one child at a time". The New Yorker: 34–40. ISSN 0028-792X. ↑ Rinaldo C (2005). "Passive Immunization Against Poliomyelitis: The Hammon Gamma Globulin Field Trials, 1951–1953". Am J Public Health. 95 (5): 790–9. doi:10.2105/AJPH.2004.040790. PMC 1449257. PMID 15855454. ↑ Neumann D (2004). "Polio: its impact on the people of the United States and the emerging profession of physical therapy" (PDF). The Journal of orthopaedic and sports physical therapy. 34 (8): 479–92. PMID 15373011. Reproduced online with permission by Post-Polio Health International; retrieved on 2007-11-10. ↑ Cuccurullo SJ (2004). Physical Medicine and Rehabilitation Board Review. Demos Medical Publishing. ISBN 1-888799-45-5. ↑ Trojan DA, Cashman NR (2005). "Post-poliomyelitis syndrome". Muscle Nerve. 31 (1): 6–19. doi:10.1002/mus.20259. PMID 15599928. ↑ Sanofi Pasteur. "Poliomyelitis virus (picornavirus, enterovirus), after-effects of the polio, paralysis, deformations". 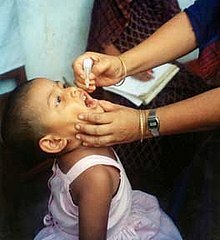 Polio Eradication. Archived from the original on October 7, 2007. Retrieved 2008-08-23. ↑ Mayo Clinic Staff (2005-05-19). "Polio: Complications". Mayo Foundation for Medical Education and Research (MFMER). Retrieved 2007-02-26. ↑ "Post-Polio Syndrome Fact Sheet: National Institute of Neurological Disorders and Stroke (NINDS)". Retrieved 2011-08-02. ↑ Trojan D, Cashman N (2005). "Post-poliomyelitis syndrome". Muscle Nerve. 31 (1): 6–19. doi:10.1002/mus.20259. PMID 15599928. ↑ Lin K, Lim Y (2005). "Post-poliomyelitis syndrome: case report and review of the literature" (PDF). Ann Acad Med Singapore. 34 (7): 447–9. PMID 16123820. ↑ Mastny, Lisa (January 25, 1999). 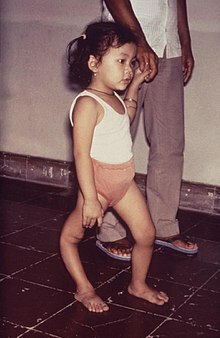 "Eradicating Polio: A Model for International Cooperation". Worldwatch Institute. Retrieved 2008-08-23. ↑ ୪୭.୦ ୪୭.୧ Centers for Disease Control and Prevention (CDC) (2006). "Update on vaccine-derived polioviruses". MMWR Morb Mortal Wkly Rep. 55 (40): 1093–7. PMID 17035927. ↑ "Smallpox". WHO Factsheet. Retrieved 2008-08-23. ↑ Centers for Disease Control and Prevention (CDC) (1994). "International Notes Certification of Poliomyelitis Eradication—the Americas, 1994". MMWR Morb Mortal Wkly Rep. Centers for Disease Control and Prevention. 43 (39): 720–2. PMID 7522302. ↑ , (2001). "General News. Major Milestone reached in Global Polio Eradication: Western Pacific Region is certified Polio-Free" (PDF). Health Educ Res. 16 (1): 109. doi:10.1093/her/16.1.109. ↑ "Europe achieves historic milestone as Region is declared polio-free" (Press release). European Region of the World Health Organization. 2002-06-21. Retrieved 2008-08-23. ↑ Fine PEM (2009). "Polio: Measuring the protection that matters most". J Infect Dis. 200 (5): 673–675. doi:10.1086/605331. PMID 19624277. ↑ "New polio outbreak hits China - CNN.com". CNN. 2011-09-21. ↑ "India polio-free for a year: 'First time in history we're able to put up such a map'". The Telegraph. 26 February 2012. Retrieved 26 February 2012. ↑ Christopher Hitchens (2008). God Is Not Great: How Religion Poisons Everything. Allen & Unwin. p. 51. ISBN 978-1-74175-572-5. ↑ Melnick JL (1990). Poliomyelitis. In: Tropical and Geographical Medicine (2nd ed.). McGraw-Hill. pp. 558–76. ISBN 0-07-068328-X. ↑ "Louise Reisner-Sénélar (2009) The Danish anaesthesiologist Björn Ibsen a pioneer of long-term ventilation on the upper airways". Frauenthal HWA, Manning JVV (1914). Manual of infantile paralysis, with modern methods of treatment: Pathology. Philadelphia: Davis. pp. 79–101. OCLC 2078290.